Unsettled weather will move into the Finger Lakes from the southwest with rain showers possible as early as dawn Tuesday. High pressure holding control of the Finger Lakes will be eroded away from the south and west on Monday. Clear skies associated with the high pressure made for a cold start to the week, with many areas dropping into the teens and low 20s. This is some of the coldest air yet this season, but it will not stick around. A broad southerly flow across the eastern United States is setting up. High pressure will keep its influence on our region for Monday, with sunny skies and temperatures near or just shy of normal. Later in the day though, clouds will increase as warmer air approaches. Temperatures this evening will initially drop back into the low and mid 30s before slowly rising overnight. Clouds will continue to thicken, and the first rain showers should start to arrive near or just before sunrise on Tuesday. On and off rain showers should persist for much of the day on Tuesday, but southerly winds will help temperatures rising well into the 40s. 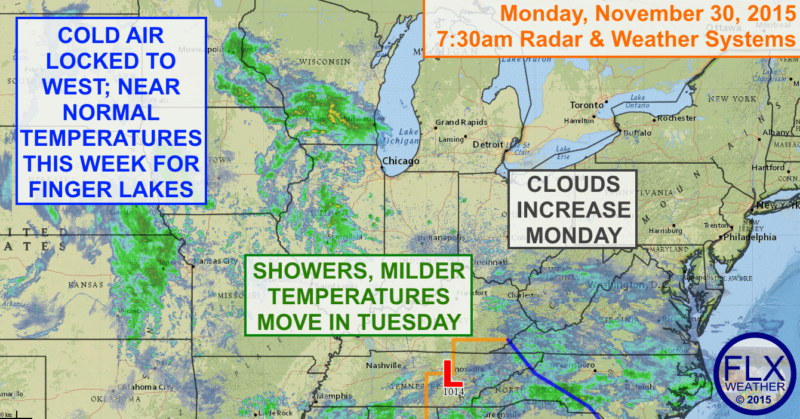 Temperatures will hold steady or even rise a couple more degrees Tuesday night with rain showers continuing. Wednesday morning, temperatures will be in the mid to upper 40s with a few more lingering showers. Cooler air will start to work in behind a front, with temperatures dropping through the 40s during the day. Later in the day, the eastern parts of the Finger Lakes may see some additional rain as a low pressure system moves north along the front. The exact track of this system remains uncertain though, and the storm could pass east of the Finger Lakes all together. A cool, moist flow of air over the Great Lakes will produce a spray of lake effect precipitation on Thursday. With temperatures mostly in the low 40s, this should primarily be rain. Late in the day though, some of the higher elevations of the eastern Finger Lakes could mix with some snow. High pressure then builds in for Friday and the weekend, with sunshine and temperatures near to just slightly above normal.